Integration of two sides of the spiritual coin—the inward life and outward action —served as the focus for this year’s North Pacific Yearly Meeting (NPYM – http://npym.org/news.html), the annual gathering of Quakers in these parts. For four days in mid-July, a couple hundred of us from Washington, Oregon, Idaho, and Montana met with Friend-in-Residence Michael Birkel (an Earlham College professor, writer, and John Woolman scholar) and worshiped and shared around this theme. Michael presented evidence from the writings of both Woolman and Margaret Fell of the need for both contemplation and activism. Learning to balance these two in my own life continues to be central to my spiritual journey. At the closing worship at Yearly Meeting, someone suggested that Spirit is a bird—with one wing contemplation and the other, action. “Contemplation without action,” she said, “and action without contemplation, keeps Spirit from flying.” I know the perils of trying to keep Spirit airborne with only one wing. For many years, I valued action over contemplation. Awakened to injustice in the world, specifically health care for the poor, I devoted myself to public health. I felt so compelled to fix the brokenness I witnessed that I neglected my own spiritual nurture. There was always more to do, and do, and do. Eventually, I could do no more. I took a long break from caregiving and experimented with a more contemplative life. I discovered how parched my soul was and that I was being called to new work, more inward work, as a writer. Now I sometimes wonder if I’ve swung too far to the side of contemplation; I worry that my writing is not the kind of outward action that is needed in the world. While I yearn to have both contemplation and activism at work in equal measures in my daily life, I have yet to achieve the kind of steady balance I see in the eagles, herons, and gulls in flight near my home. Since returning from Yearly Meeting, I’ve been considering that paddling my kayak may be a more apt image for my efforts to integrate my inward, contemplative life with the pull toward outward action. 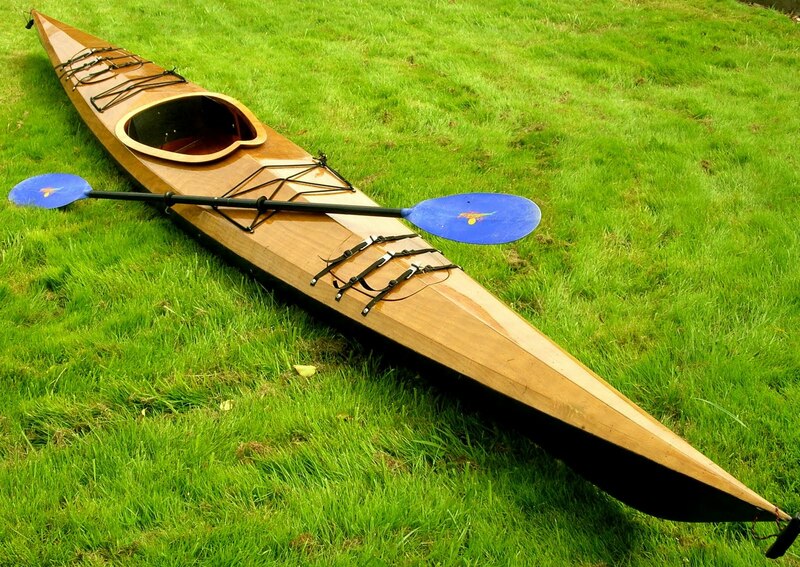 On my 49th birthday, I bought a kit to build a wooden kayak. Over the next year, I assembled the dozens of pre-cut pieces of mahogany plywood to construct a 17 ½-foot, single person kayak. I spent hours mixing epoxy, gluing, nailing, and clamping the jigsaw puzzle together; layering fiberglass and varnish; then sanding and varnishing, sanding and varnishing, and several more rounds of sanding and varnishing until the boat’s deck glistened like honey. I sanded and primed the hull, too, then painted it a deep purple that I had created by mixing red and blue marine paint. Late afternoon on the day I turned 50, I launched this vessel I’d built with my own hands (along with considerable help from a boat-builder friend, as well as the loan of a couple dozen of his C-clamps). Every time I take it out in the saltwater for a paddle, it nourishes and instructs me. I’m a fair-weather kayaker, preferring the time for quiet and reflection that paddling on calm water offers. I didn’t install a rudder on my kayak—didn’t want the complexity of cables and foot pedals to turn a plastic blade on the boat’s stern. Instead, I use my paddle and the shift of my body to steer and balance. As I glide into the bay, the only sound is the lapping of the seawater against the hull and the dip and swish of my paddle. When the wind and currents are flat calm, my paddle’s rhythmic slice and pull through the water, first on the left, then on the right, repeating the alternating motion, keeps my boat balanced. Even in that gentle sea, though, I have to vary my rhythm and pattern. Sometimes I paddle hard on one side to avoid tangles of kelp and seaweed. Unlike the eagle overhead lifting and lowering its wings simultaneously, at times I bend my torso to the other side, salty droplets sprinkling off one blade of my paddle as the other digs deep to turn my bow out of the path of a seal that pops up just beyond my bow. This seems more like the rhythm of my spiritual life—sometimes steering more toward action, at others, quite fully in contemplation. For now, I’m following the pull to focus my outward action on my own community and writing for the wider world. However, I remain alert and open to the currents of other forms of action, praying that I’ll be able to lean into them, maneuvering with attention to both the inward and the outward life. I loved your just-published blog piece. It echoes some of what you said at meeting on Sunday but goes much deeper and is richer and more reflective. I like the metaphor of kayaking. Nicely done!